Anything you need these days, you can bet there’s an app for that. 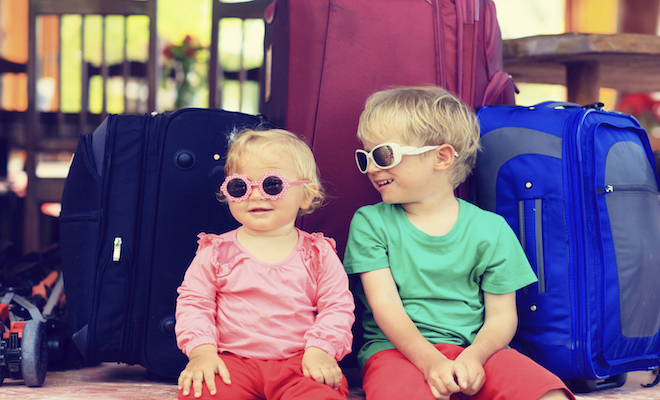 Traveling with tots is no different. Moms and Dads can find smarter, safer ways to travel with the kids this fall thanks to a few family-savvy apps. Below are some of our favorites! Similar to phone tracker apps such as Life360, MamaBear goes a few steps further to make sure her cubs are safe. Along with location sharing, this smart app allows Mama Bear to monitor her kid’s speed while driving. It is possible to monitor in and outgoing texts or watch social media activity on sites like Twitter, Youtube, and Facebook all within the app. Next time the big kids want to play away on the family trip, this handy app will offer some peace of mind. For all those times that you hear those emergency words, “I need to go potty” during the trip, Charmin has an app for that. Sit or Squat is an app made by the toilet paper company that lets users find bathrooms fast based on their location. Each potty spot has a ranking or review by other site users, ensuring that you find the perfect tidy toilet fast! In the hustle of loading little ones into the car, it’s easy to leave behind essentials. With the Baby Pack and Go app, parents can confirm that they’ve gotten everything they need from pre-made packing lists! The app allows the user to make packing lists in advance, adding items that they know they’ll need. For folks with little time to list make, the app also offers some Ready-made packing lists that cover the essentials. For a mom who wants activities on the go, Mommy Nearest is where to turn. Again, the app scouts your location and then offers activities and events that are going on in the area. Real-time reviews from other parents and app users explain and rate the area events. And for sits on the side of the playground, the app offers relevant and timely family-related articles to browse. With snowy sports and sunny escapes on the rise in fall and winter, parents should be wary of the surprise sunburn. Watch your exposure with Wolfram Alpha’s technological version of SPF, the Wolfram Alpha Sun Exposure app. This handy dandy reference app not only provides UV forecasts and maps, but also automatically computes your recommended levels of exposure based on duration and location. Never fry with the family again! An acclaimed app of destination-based games, LumiKids will offer games to keep the backseat quiet while building motor skills during a long journey. With games like feeding the “nom-nom” critters to build visual-motor coordination or helping crabs build sandcastles to build response inhibition, Lumikids offers adventures on the way to the park, the beach, or in the snow. Lumikids backyard will have the tots problem-solving and logically thinking along with the garden gnomes in their mushroom factory. The car ride will be done before you know it!